Essentially what these do is help you from falling when out running(or hiking/fishing) when it's icy or you need some additional traction. They are spikes that you attach to the bottom of your sole to give you traction in snowy and/or icy areas. A perfect product for running when it's winter. Well, at least where it's winter. This even comes with a special grip to screw the special spikes to your shoe. I actually just used my electric drill to do it but its nice to have this handy in the car if you need to replace a spike or add another one to your shoe or your running buddy's shoe. As you can see below, there is an socket attachment that also fits in your drill and the attachment is magnetic so you can stabilize the screw in the attachment. I found this helped with easier placement in the shoe. The screw itself is a 3/8 inch screw to allow enough length to give a firm grip so it will not come out but also is not long enough to go through your shoe. Of course, if you run in any type of barefoot shoes, these are not going to be an option for you since you need some cushion on the shoe to give it a place to put them. Below is a close up of the special head that helps to grip the ice to give you traction on your soles. I could tell when running that these grab the ice well. I'll explain a little more later. Here's a look at the shoes with the spikes on the shoes. The company provides some directions and options for best placement and stability. I always say the simplest products are the best products. This is another great example. Screw them in, run in treacherous conditions! I like the way the Goat Head Gear people think. They want to be outside just like me and, while many people think I'm crazy to run in some of the conditions we have in Michigan, I think it's crazy to not be outdoors all year. The outside of the bottom of the shoe seemed to work well for me which was also the suggestion of the company. 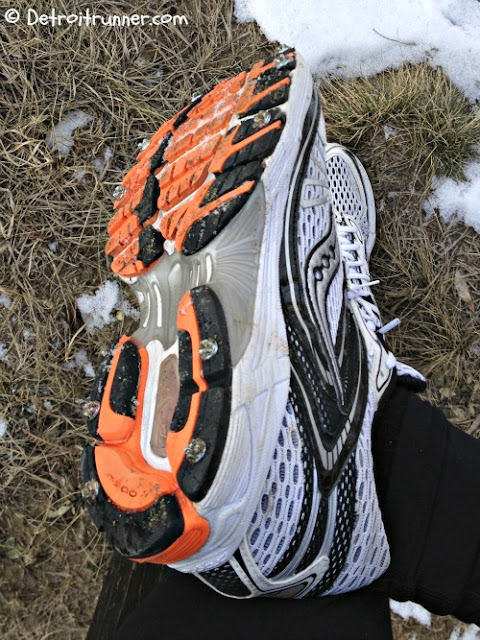 By placing the spikes on the outside, I could feel the grip of the spikes but I didn't feel like they were pushing into the shoe as I was running and changing my running gate. I did a test run at my local trail. 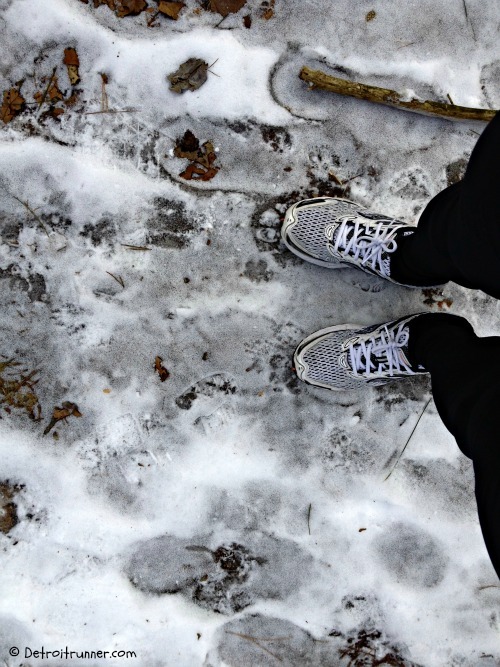 It was a cold, icy run as Michigan has had a fairly tough winter this year. It does not look like it in the picture below but the trails were snow covered and very icy as well. 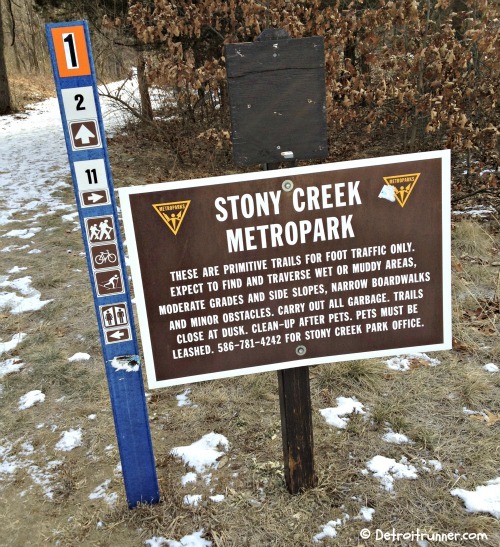 The ground was completely uneven from tracks of others on the trail which left it very difficult to run on without any traction on your shoe. A perfect place to test out the Sole Spikes. I'm ready to run! I admit that I don't hit the trails as much in winter because its a very tough run and I don't want to fall. The sole spikes will change that! 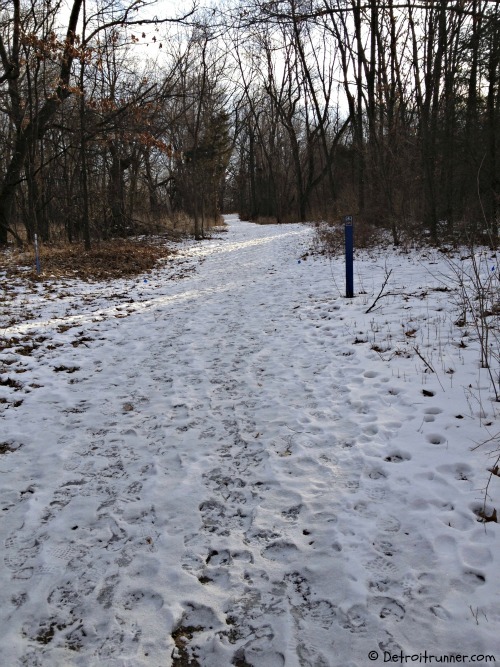 This time I ran about 3 miles which was enough for me given the uneven terrain with the ice. The picture below gives you an idea of what I was running through. I know, I know. It's nothing what the East coast has gotten but this is about icy conditions. I never would have even tried to run on this terrain without the Goat Head Gear. 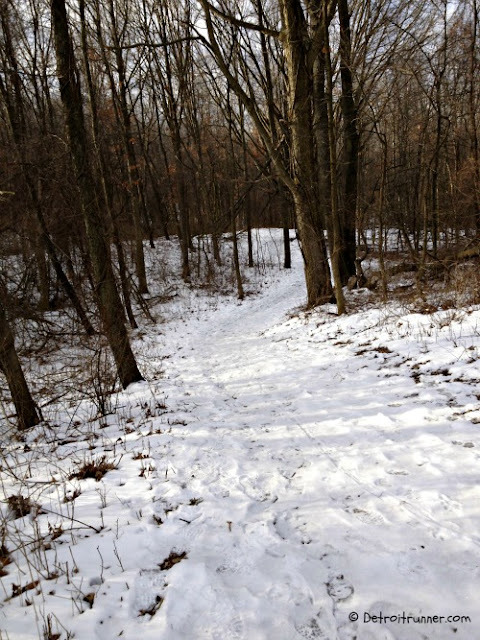 Without the Sole Spikes, I would have probably fallen on this downhill icy trail. In fact, had I not had the sole spikes on, I would have thought the same thing most people think of me when running in the winter - this is crazy! However - the spikes performed flawlessly. While I had to still slow down, not once was I worried about falling on the trail and they gave me the confidence to be out there without worrying about getting hurt. See? Lots of ice to deal with. I urge anyone that wants to remain on the trails or the icy roads in the winter to get a set of these for your safety. On another test run, I ran out in a very snowy, icy, slushy run where we got about 5 inches of snow just that evening. I decided to add a couple more screws in the center of the shoes and one more on the side and try a different pattern. I actually didn't prefer this because I could feel the screws in the center more and really want them to just feel like my regular running shoes. In addition, I didn't feel the extra screws in the middle really helped add any more traction out there. You can see there's still some ice left on the shoe after my run. I was pleasantly surprised with how the Goat Head Gear Sole Spikes helped on both the ice and snow. While I used a pair of older shoes(about 200 miles on them), you can easily screw and unscrew these out of your shoes if needed. I would suggest that if you have an extra pair of shoes like me, just add the Sole Spikes and leave them in. This way you have a dedicated pair ready to go when the weather turns. For those that might not use them much, there's no worry that I saw in screwing these into newer shoes as long as you are not constantly putting them in and out. I agree that these are not just screws and will provide not only a better grip on the ground due to the special head but they are made specifically for this. Regular screws are not made to be pounded on when doing things such as running. If you are like me and will run in any weather, you will want to check out Goat Head Gear. It will keep you running outside and off the treadmill. I'm coming up on my two year anniversary for no treadmill running and I'm really glad Goat Head Gear sent me these for review because I'm not sure how I would have gotten out there daily in this years weather conditions. They have helped me keep my outdoor running streak alive! 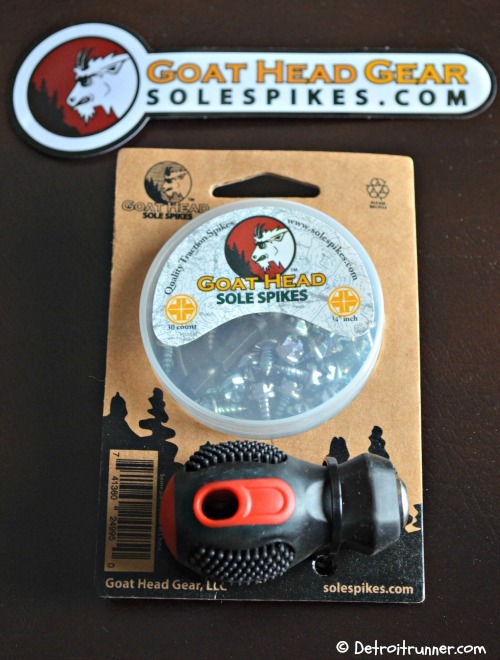 * Note - I received a Goat Head Gear Sole Spike starter pack in exchange for this review. All opinions on this blog post are my own and I was not paid or required to give a particular opinion on the product. Great Review! Heck! I could have used these for the path at stoney this past weekend as it was loaded with ice! Seems like an awesome idea and I would love to try a pair out. This winter has been very icy and snowy here near Ottawa Canada. I fell 3 yrs ago and broke my arm. I tried various crampons. I have both the 1/2 inch and 3/8 inch spikes. I walk a lot with my dogs. Where others have slipped, I have remained stable and could walk with a good stance even on blue ice. I use the 1/2 inch spikes on my winter boots. And the 3/8 inch spikes on my Cat shoes. 15 per boot and 8 per shoe. I have not lost one. They did not even come loose. I have spent my entire winter feeling 100% secure about my step. After a long winter, I see no signs of wear on them. There was a human error mistake on my first order. The service was impeccable. I received my spikes rapidly. I am impressed with the quality and the service. They get 5 stars. Thank you for improving my stance on ice and snow.